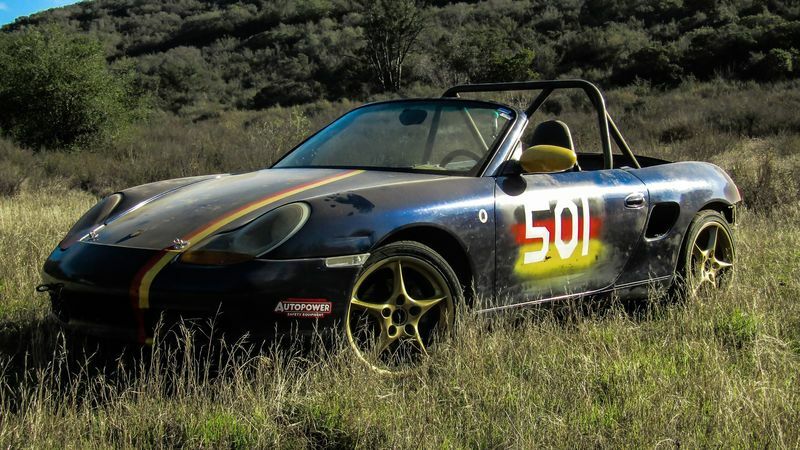 Joining the Porsche family, track rat style. 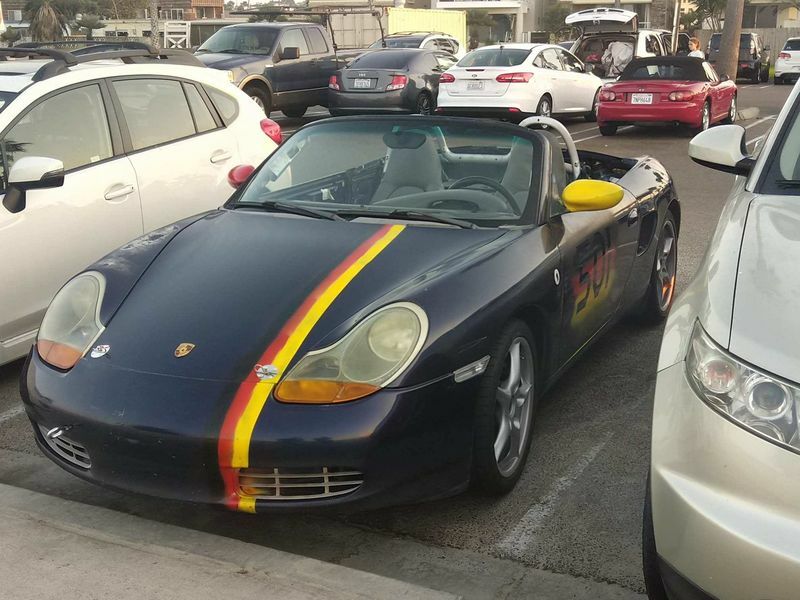 I've seen plenty of incredibly nice, well-preserved, and gorgeous Boxters and other Porschii around, on the interwebs and in the area I just moved to. 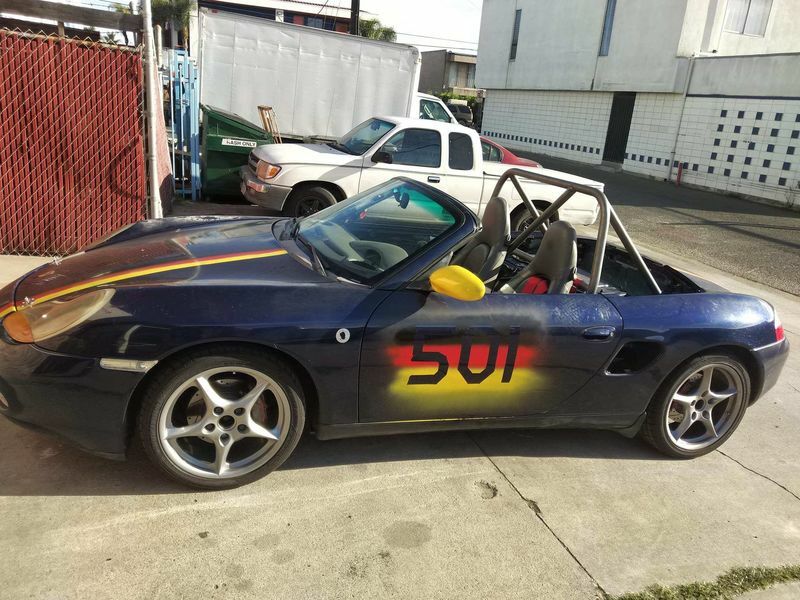 (San Diego area) I got this car with the sole intention of a fun track toy. It was decent when I got it. I never had an intention of it staying that way. 2001, 2.7, manual, 150-WHATEVER miles. Myself and a friend wanted a project, so we got one. 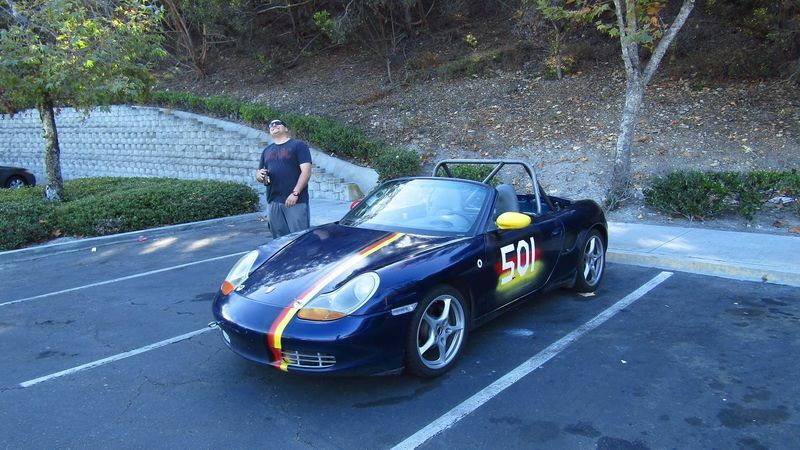 When we picked it up, it was a perfectly fine, bone stock, in good shape road car. It is not now. Actually, what we did was strip it completely. 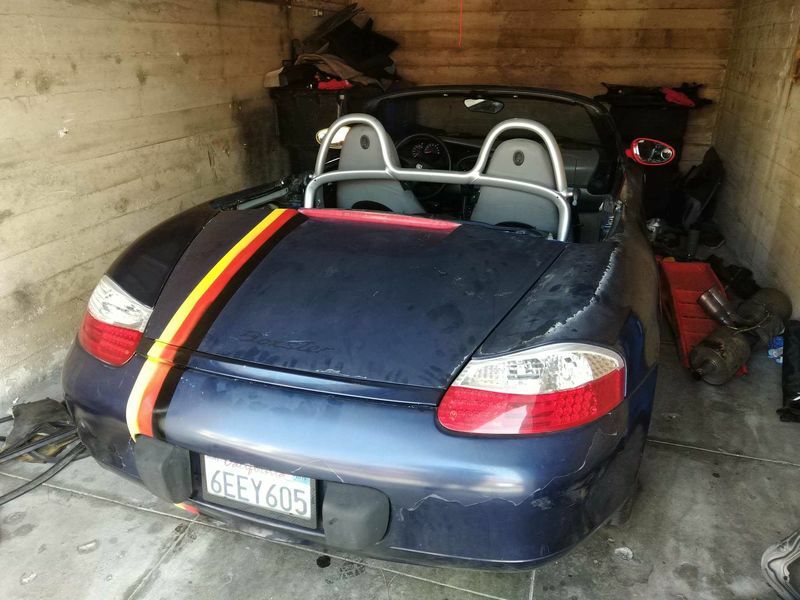 (BTW, for sale is now roughly half a Porsche; plastics, carpets, interior bits, etc.) 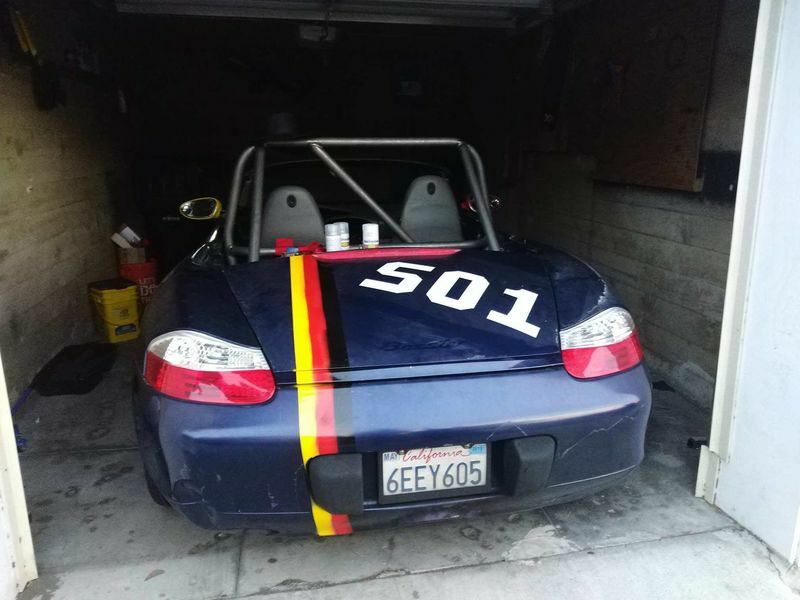 At the moment, it's at Autopower of San Diego getting a cage and belts, first track day is this weekend at Willow Springs. Not looking to get into any series, we just want to get on the track. (Returning from a several year absence myself, and dragging some poor sod with me.) For now, the powertrain is bone stock. Because of the high mileage, I'm gonna assume the IMS was done, at least for now. If the motor blows this weekend, I'll get a 3.2 to cram in there. If not, it'll get done when we do the kinda sketchy clutch. We're just gonna do this weekend and see what happens, because why not. 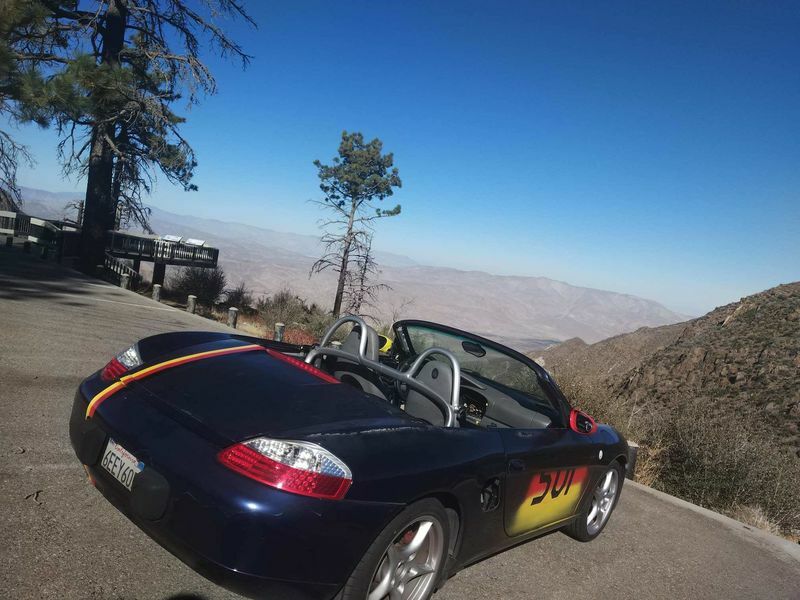 This isn't a road car, and I don't have any preconceived notions of keeping it on the road, even for weekend drives. I have a few pictures of us on the road a day or two after we bought it, but that was it. I need something to keep me busy on the weekends, so whether it's on the track or wrenching, this one should be fine. I hope this thread brings some much-lacking depravity and mechanical perversion to this far too sensible forum. Cool! I hope you have a lot of fun with it! it's the sort of outlaw behavior thats appreciated here. 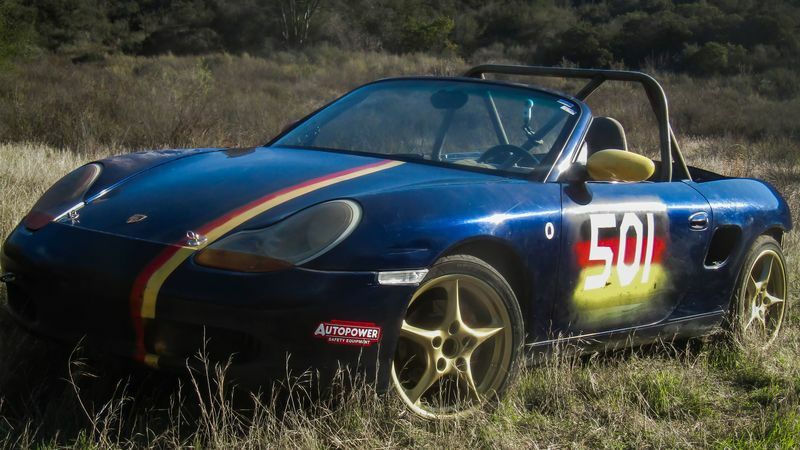 (Something for everyone to remember for greatest flexibility with your boxster builds - the early cars have value as the race cars - '97-'99 chassis)(...but fenders are fenders, hoods are hoods...etc you get that picture). I love this! More! MORE! I like the attitude and congratulate anyone who wants to get onto the track. Show us some of the mods like the cage, etc! Where in SD do you live? 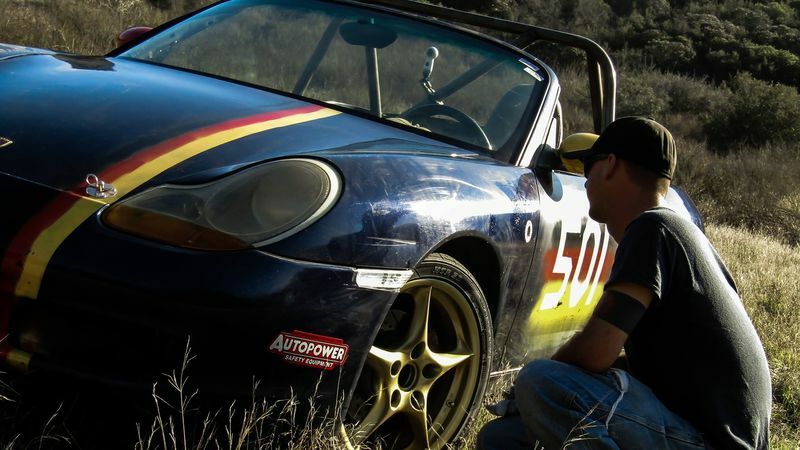 The San Diego chapter of PCA is one of the largest Porsche clubs around and we do a ton of events including track weekends. Streets is a great place to get back into tracking your car. If you need a top notch mechanic, PM me and Ill send you his info. There are a lot of great Porsche shops in town, but this guy I like the best. Unfortunately, got the news today that the event we were going to at Willow Springs is a Honda only event. (Anyone ever dealt with eXtremespeed track events before? Their website isn't very well layed out.) Whatever, rescheduling for the 1st at Buttonwillow. 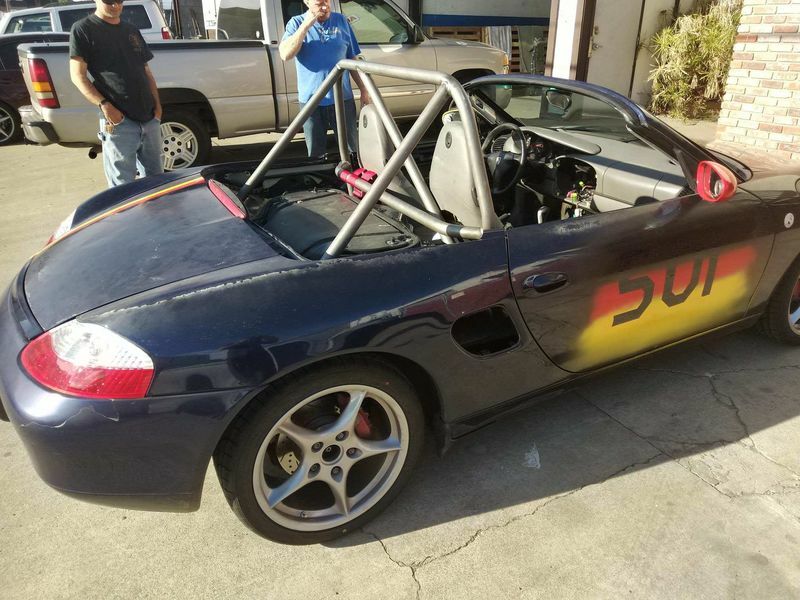 If you're in SoCal and need a cage, I highly recommend Autopower. 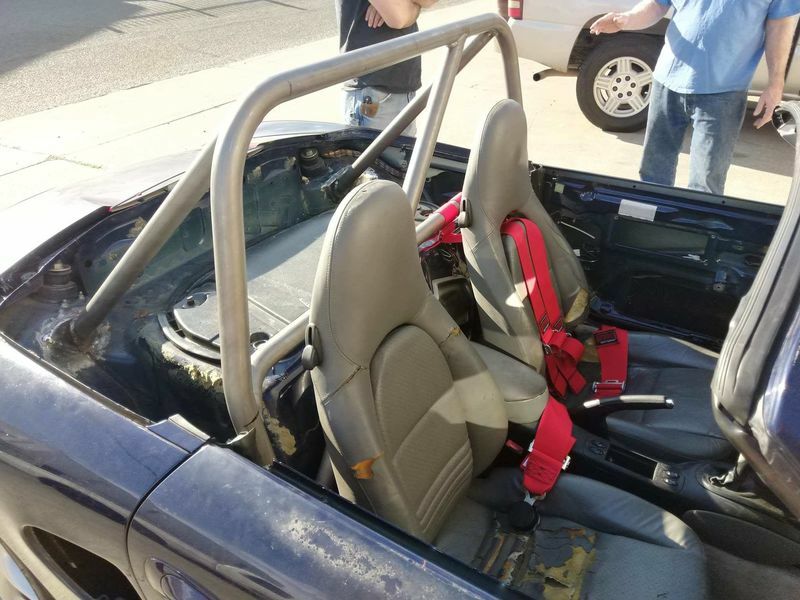 They did the cage quickly, for a good price, and made a great quality 6-point harness. 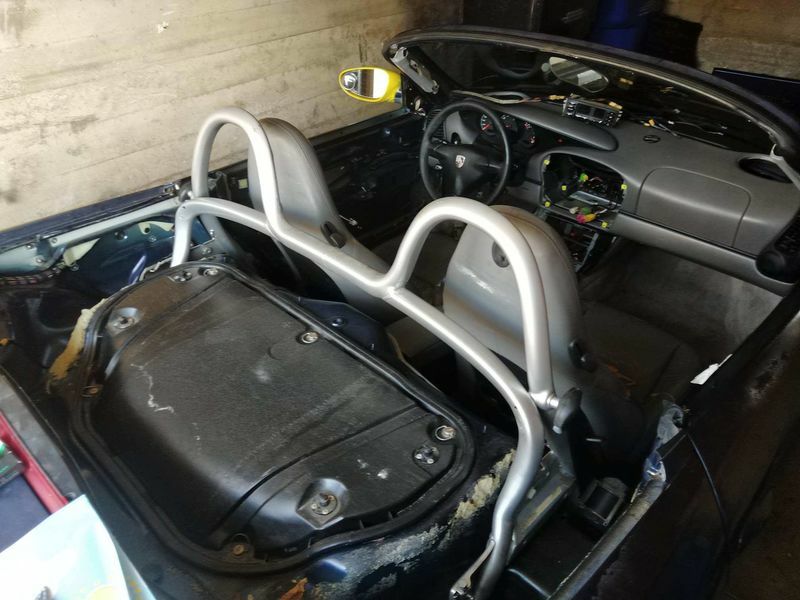 The roll bar is custom, but I bet they can duplicate it easily. The welds look great, and it's mounted well. However, it would never fit under a top. 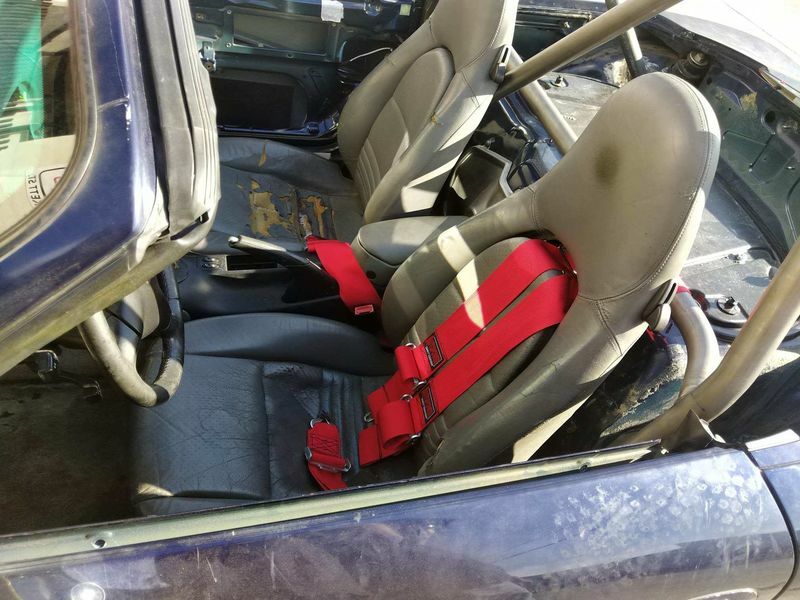 Yeah, we just cut the stock seats to route the harness through. They're crap anyways. Tomorrow's goals (woot woot racecar thanksgiving!) include putting a clear coat on the roll bar to prevent surface rust, painting the numbers on the side white, and seeing if I can get the spoiler to deploy. It doesn't work, and I want to see if I can get it up and just lock it there. Anyone know anything about doing that? 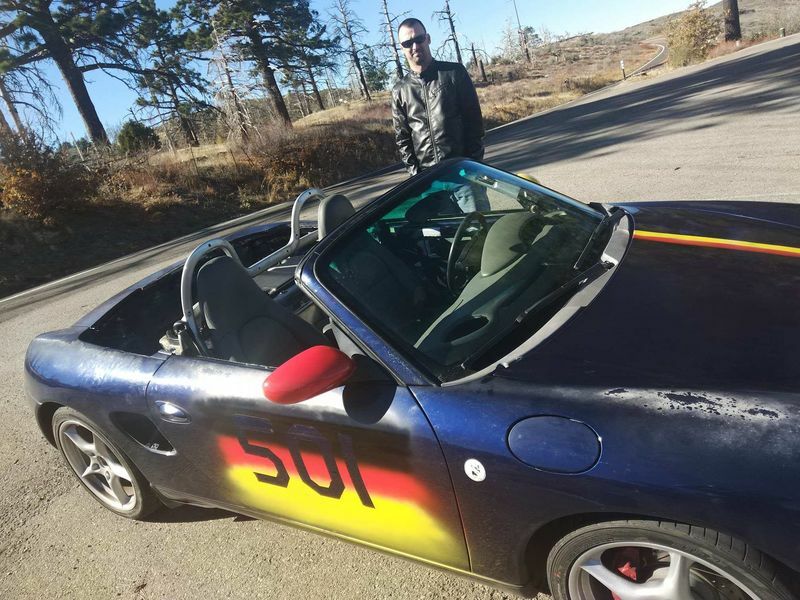 Porsche Owners Club is running at Willow Springs next weekend. Come check it out. Do I need to sign up to PCA, or can I just show up? I'm still trying to figure out what these eXtremespeed guys are going to do, whether it's a reschedule or refund, whatever. I'd much rather come run Willow with like-minded folks, but we've already paid the registration fees for the other guys. For PCA and probably POC you need to join, which you can do online. After next weekend, I'll look into them and see which one i'll feel like joining. Trying to learn how to edit videos right now. I decided to form a Youtubes channel for this build and whatever nonsense I feel like posting. Tried to put a new post linking the youtubes, but it didn't work, probably because I put the link directly in there. Search WizardSmokey on YouTube and it should be the first result. Whatever, today we filled in the numbers on the side in white, and I removed the windshield wipers, motor, linkage, and associated large plastic cowling. Then we went to a parking lot to take pictures. Basically, this project is coming along beautifully and progressively. At the auto-x, we completely shredded the clutch chasing the podium, so right now we have the car on jackstands and are chipping away at it after work each day. We're planning on utilizing all day Saturday to get it done. Then it's off the the dyno for a baseline run before we do any power modifications, just so we know if we actually manage to improve anything. Very cool. I have a similar build going on. Sometimes you can find good used racing tires at bigger events. Heck the race I was just at was broadcasting over the intercom that there were free tires for whoever wanted them. Finding 17 inch tires is easier to find than 18's though. I suggest switching to 17x8.5's if you can. Those wheels you have on now can sell for $1000-1500 a set. Really now? Why is that? What are they from? Several changes since the last update here, forgot to get good pictures of some. First, the clutch is replaced, and it's AMAZING. Dash is completely gutted, with only the aluminum supports and gauges still there. (gauge pod is zip-tied to the cross bar.) That puts the car down to 2,460lbs, with the a/c and power steering still on, coming off as soon as we can dyno and get a baseline to see how much we free up with the delete. Maxed out the stock camber adjustments. About -0.7 on the front and looks about like -2.5 or so on the rear. Handling is noticeably gooder, and took all of an hour to do. Got some artwork done on the interior and painted the rims. Went and found a dirt road. 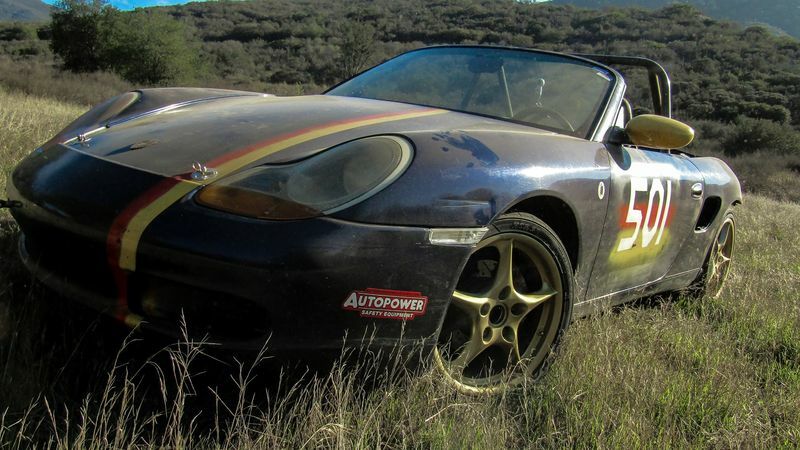 Turns out the 986 isn't a terrible rally car. Looks like you are having fun. Good for you. 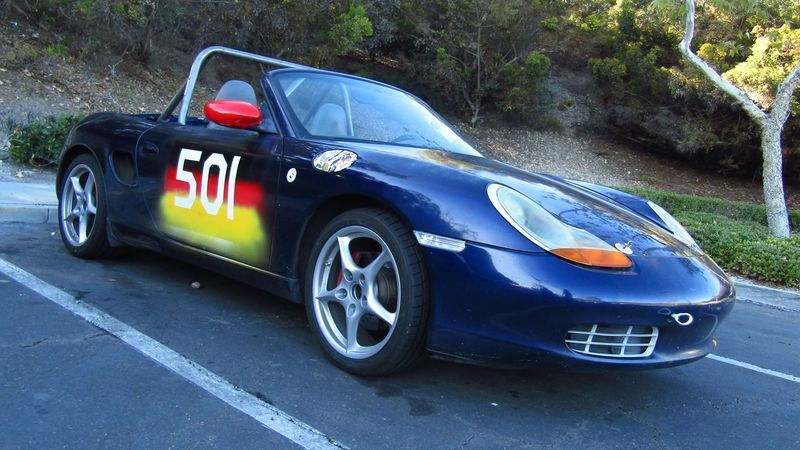 Those wheels look like they are off of a 996.2. I believe they are made by BBS. The seat and harness set up will not pass a PCA tech inspection. I would encourage you to talk with the organizations you plan on running with regarding their minimum standards/rules. This is a way to ensure your build is in compliance and you do not have any issues once you get to the track. itsnotanova: Thanks for the warning. We didn't have any problems, but we were also mostly just drifting on a smooth dirt road. Also probably not going to come a habit, we just had the idea then acted on it. I'll look into reinforcing it.